Hello from Alex once again! As I was thinking of ideas for a track I was looking at skyboxes in hope of some inspiration and I found a nice space skybox so I thought about what I could do in space. My first thought was Rainbow Road. I looked up all the Rainbow Roads that exist and it turns out I don't like any of them so I thought I'd try my hand at making one. No offense to the creators of those tracks of course. 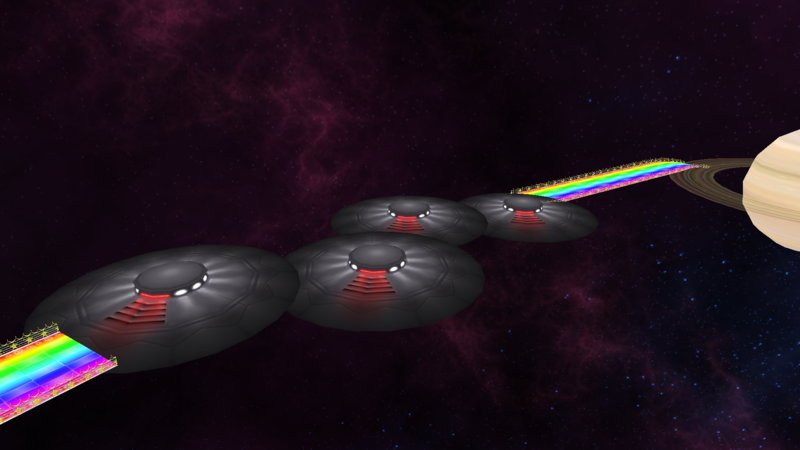 Rainbow Road is the traditional last track of all Mario Kart games which takes you on the titular road made out of rainbow through various space and Mario (obviously) themed obstacles as you race. It is usually one of the hardest and sometimes one of the longest tracks although whether or not I will emulate that is still up in the air. Right now I'm still very much at the beginning which means gathering ideas and inspirations. My main inspirations are the Rainbow Roads of later Mario Karts although if the idea is good anything goes. At the moment I have a basic map with various ideas crudely stitched together. It is still very early, not final and proportions are most likely way off so it's not worth showing. If you want to suggest something yourself feel free to do so and I might add it in if I like it. One thing I don't want it to be is basically Terminus on a rainbow where it's an absolute snoozer with slower cars so obstacles and tight corners can be expected. Maybe it's too early to make a thread but I do want to get some feedback early on. I'm still not completely sure if I want to go through with this idea but I do hope you're all not too opposed to it. Interesting. You're right, the only good Rainbow Road as far as I know is GBA Rainbow Road, and that's a recreation of an existing track instead of an original design. It would be cool to see one designed for Re-Volt! I was making a Ribbon Road (from Super Circuit) track for Re-Volt using the off-road kit, but I never finished it. So I went ahead and got started and things actually turned out fine. The skybox goes really well with the Mario Kart Wii textures. The ufos had to be flattened to make them not terrible to drive on. They're not completely flat though so they still provide a challenge. Looks pretty good. Are you planning on a reverse course? Might be able to put those ufos in as instances and tilt them the other way. Not bad! That looks a lot more interesting than I expected at first sight.